I’m briefly back in the Netherlands to attend the premiere of Fresas, the latest dance production by Dutch National Ballet scored by my hubby, also known as Robin Rimbaud (artist name Scanner). This isn’t their first collaboration Last year they worked together on the extremely well-received dance production Narnia: The Lion, the Witch and the Wardrobe, which sold out its entire run of thirty shows across the Netherlands. Fresas premieres in Den Bosch (NL) on Tuesday 23 February and was especially created by Spanish guest choreographer Juanjo Arqués for Bosch500, a year of celebrations to mark the 500th anniversary of Jheronimus Bosch’s death. 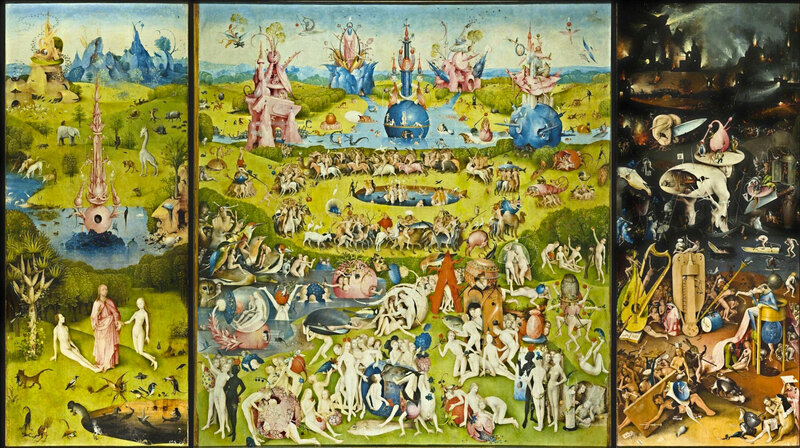 Fresas was based on Bosch’s most famous triptych The Garden of Earthly Delights, which you can admire at Prado Museum in Madrid. I have heard the music for the dance come alive over the last months whilst Robin was working on it in his home studio and am very curious to see it come together with the dance. You’ve worked with Dutch National Ballet on several occasions now. How did this relationship come about? And on which productions have you worked with them since then? Like so much of my work these days it’s a surprising email that brings such joys into my life. I first performed live at the venue itself, Het Muziektheater in Amsterdam back in 2002, with my work Nemesis, in collaboration with celebrated choreographer Wayne McGregor and his company Random Dance. Subsequently I collaborated with David Dawson on Timelapse (Mnemosyne) in 2011 and Narnia with Ernst Meisner and Marco Gerris of ISH (2015) at the theatre itself. At the same time projects initiated by Dutch National Ballet have included the extraordinary Canta Ballet with Ernst again in 2012, which took on a life completely of its own as a TV show and incredibly moving performance in Westergasfabriek, the former industrial zone of Amsterdam. Then Ernst and I created a new work for the re-opening of Het Stedelijk Museum Amsterdam in front of the Dutch Queen and Royal family. So that’s progress for you. What is the process like when you create a dance score? Does the music come first or the choreography? Very rarely does the music come first. Most frequently it’s a series of exchanges, sometimes simple, sometimes abstract, sometimes seemingly impossible, over email and conversation, towards something that both of us have an idea of but need to find a way to arrive at the same point and place in time. Sometimes it’s like Apple Maps versus Google Maps. You share a destination but the direction you take can alter, and yes sometimes you get lost! Most often a choreographer will have a good idea of the kind of work I produce so that makes it a little easier but there’s certainly something quite unique about this experience of sharing such a dynamic creative process. The choreography for Fresas (strawberries) is based on Jeroen Bosch’ famous triptych The Garden of Earthly Delights. Did you also use that painting as a reference for the music or were you mostly led by the choreography? The Spanish choreographer I’m working with, Juanjo Arqués, had chosen this painting as his inspiration and I’m familiar with the overall shape, character and structure of this work. However in the actual making of the piece we focused more on themes of temptation, of lust, moving from light to darkness, so it remained a stimulus at the back of my mind but I was more conscious of mapping the movement of the bodies within a tight time structure. Interestingly though we read the painting from left to right [Paradise, Earth, Hell], the structure of our piece will work backwards. The Garden of Earthly Delights (ca. 1500) by Jheronimus Bosch (1450-1516). Click on the image to view. Detail of the triptych above. The strawberry (fresas in Spanish) represents earthly lust. Art plays an important role in your life. Can you describe in what way it influences your work and life? It’s almost impossible to find words that encompass what resonance art plays in my daily life and personal wellbeing. Since my earliest memories I recognise I’ve been drawn to those folks creating magic out of their experiences and imagination and how much words, pictures, sounds, movements, shapes and colours play in my joyful life. Having ensured I always bought catalogues of shows that inspired me, my book collection is a kind of portrait of my interests in itself and a walk through history. I still own the earliest catalogues I would have bought from gallery shows from around 1980 onwards, as well as vinyl records I bought as a teenager from 1977 until today. My enthusiasm and energy for discovering and sharing what I have found never ceases with age, nor the desire to learn and find new things. Which artists, past and present, particularly excite you? Do you have any specific thoughts on the works of Jeroen Bosch? Having just visited the extraordinary and impressive anniversary exhibition at Het Noordbrabants Museum, it’s remarkable to see how his works have endured and remain compelling, imaginative and inspirational even by today’s often-freakish standards. It’s truly timeless. You’ve worked with many dance companies in the past and seem to be on speed-dial for contemporary dance companies at the moment! You are currently working on five music scores for different dance companies all to be premiered over the next months. Can you tell me about these dance productions? Indeed at present whilst I’m presenting this new work with Dutch National Ballet, Fresas, with chorographer Juanjo Arqués, I’m also creating a new work with choreographer Alexander Whitley in the UK in collaboration with celebrated cellist Oliver Coates, another with Australian choreographer Lucy Guerin for Ballet Rambert in London based on Shakespeare’s Macbeth, another with choreographer Russell Maliphant at Sadler’s Wells London in June with the dancers Natalia Osipova and Sergei Pollunin, and yet another with French choreographer Thomas Lebrun that premieres in Paris in May. How do you manage to create these completely different works, especially when working on them almost simultaneously? What inspires you? I almost simply just ‘do it’ without too much concern. The most difficult moment for any creative is the blank page, knowing where to begin. I find that it’s key to make something happen, even if you were to dispose of this all in good time, but at least find a starting place. It’s a great challenge to try and project into a piece, as frequently a choreographer has not even begun making any movement on a piece at the time of the sound commission. A conversation with the choreographer is key but also a great sense of trust. I am a consistent collaborator in all fields, often with artists quite outside of the field of music. Whether it’s with a writer, an artist, a video maker, a choreographer or architect, the ability to exchange and share ideas is crucial and these collaborations allow me and the collaborator to work as both negatives and positives of each other, recognising spaces within the work fields and ideas of the other. It teaches the respect of space but also the relevance of context and extension of ones ideas to the other. They will listen to you if you listen to them, just how life should function in general. Can you explain the apparent Scanner Hotline for choreographers? Yes, I believe there’s an equivalent to the Batman symbol shone in the skies, and that’s my email address. Since 1996 when French choreographer Daniel Larrieu approached me for permission to use recordings of mine for a dance performance I’ve produced a fairly constant flow of works relating to dance. I can’t begin to explain why but perhaps because much of my work is instrumental and offers a sense of space, drama and flow it is complimentary to movement it especially works. Indeed there’s rarely a time when I am not working on something to do with dance it seems these days. What other projects, besides the dance scores, are you currently working on? I hung up my tutu and ballet shoes long ago now. Actually I had no ambition to be a dancer or visual artist as music was always a focus for me from a very young age. I very much knew with confidence when I was around 15 or 16 years old that later on I would be making work that reflected my own passions and interests. Having said that I’ve most certainly dabbled with visual artists and collage in particular. Inspired by Hannah Hoch and Joseph Cornell I have quite an archive of unseen visual works that every now and then have appeared on record sleeves and elsewhere. …thing to do in the Netherlands – Visit Den Bosch and treat yourself to the original Bosche bollen from Jan de Groot. Don’t accept any alternative. Posted in art, culture, interviews, music and tagged ballet, Bosch500, dance, dans, Den Bosch, Dutch National Ballet, Garden of Earthly Delights, Holland, JBosch500, Jeroen Bosch, Jheronimus Bosch, Nationaal Ballet, Nederland, robin rimbaud, Scanner, Tuin der Lusten. Bookmark the permalink.